Place the flour, sugar, egg, butter, milk and vanilla in a large bowl and whisk until smooth. Heat a large non-stick frying pan over medium heat and brush with the extra melted butter. Grease 9cm and 7cm heart-shaped cutters with the extra melted butter. Place the cutters on the pan and spoon in a tablespoon of the batter. Cook for 1–2 minutes each side or until golden brown and cooked through. Repeat with remaining batter. 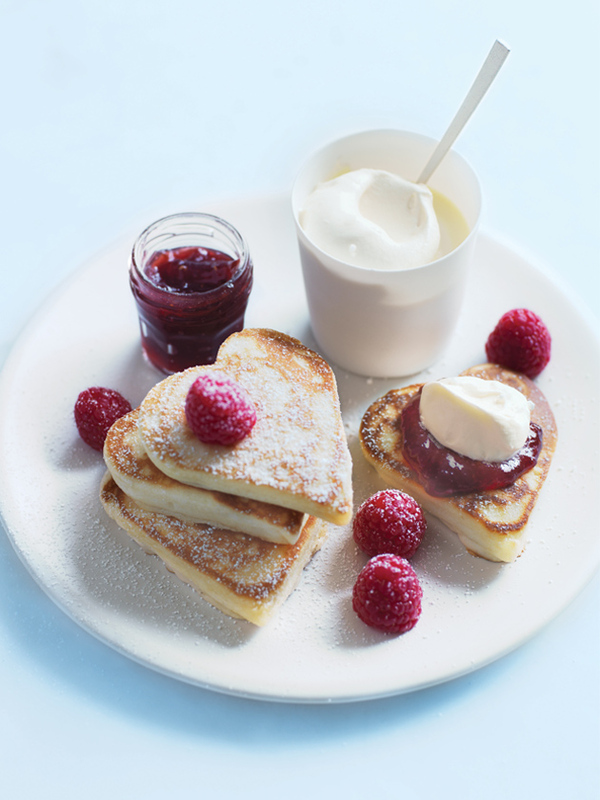 Serve topped with the jam, cream and raspberries and dusted with icing sugar. Makes 16. + Any cutter shapes will work if you don’t have heart shapes at home, just make sure you grease them well before spooning in the batter.